Photograph showing the Calcutta Docks looking along the bridge from Tolly's Nullah to dock number one taken by an unknown photographer in 1888. The river Hooghly is formed by the union of three "spill" rivers, the Bhagirathi, the Jellinghi and the Mahabhanga, which leaves the Ganges at intervals and relieves it of its surplus discharge. 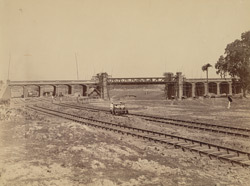 This photograph shows a view looking towards the bridge that crosses the boat canal about halfway along its length between the second dock and Tolly's Nullah, a canal constructed by Colonel Tolly in the 1770s from the dried-up bed of Kidderpore Creek to enable shipping to reach the delta to the east of Calcutta.